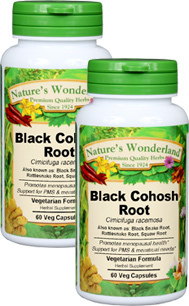 Black Cohosh Root Capsules - 650 mg, 60 Veg Capsules each (Cimicifuga racemosa) - Penn Herb Co. Ltd.
No doubt about it, Black Cohosh is one of the leading herbs for menopausal distress and menstrual discomfort. Its powerful plant compounds soothe menstrual cramps, ease hot flashes and the nervous irritability & mild mood changes that accompany menopause. However, this herbal superstar performs just as effectively for other areas of life. Native Americans and modern healers use Black Cohosh to calm the nervous system, promote joint flexibility, as a traditional blood cleanser, and so much more! Find this amazingly versatile herb in a number of Nature's Wonderland formulas including Emotional Rescue™, Joint Ease™, Cellulite Formula™ & Catfish Bitters™. ALSO KNOWN AS: Black Snake Root, Rattlesnake Root, Squaw Root. Supports menopausal health; hormonal balance; PMS; helpful during menstruation; menstrual cramps; supports a healthy female cycle; anti-spasmodic; supports healthy blood pressure; joint & muscle discomforts; respiratory health.